Whether you are buying a home or selling one, the amount of attic flooring space the house has can have an impact on its value. One thing that can sometimes be overlooked, is the space in your attic, although you could already be using your attic for storage your probably unaware of how much space is really in your roof and how much more space can be created. 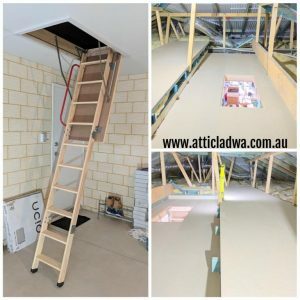 Attic Lad WA can provide and install affordable attic flooring forming a well structured area in your roof which can then add more value to your home. An attic can be used for multi functional uses. You will be amazed at what a difference having affordable attic flooring installed will make to your home at just a small cost. 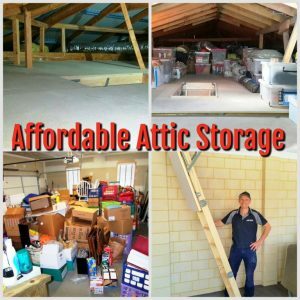 Attic Lad WA provide a friendly and fast service. We like to give our clients more then what they are expecting in the best way possible! Attic flooring can add value to your home by providing you with more extra room in your roof space giving you the maximum amount of options in your home for storage. We recently installed an attic ladder and a attic flooring Platform at a newly built home in Byford .The owners of this property hadn’t even moved in but wanted to make sure they had enough storage space before moving in. At this install a very useful 12sq meter attic flooring platform was installed with one of my popular deluxe wooden attic ladders. On completion Lester the owner was so pleased with his new attic storage, he left me a fantastic 5 star review on my Google business Page ! Professional Installation and a great result. Highly recommend Paul and his products.